The view while doing last night’s chores. Close to two feet of snow fell here a couple of nights ago and yesterday was spent digging us out and then running to get everyone fed, all their waters de-iced and everybody tucked in before dark. 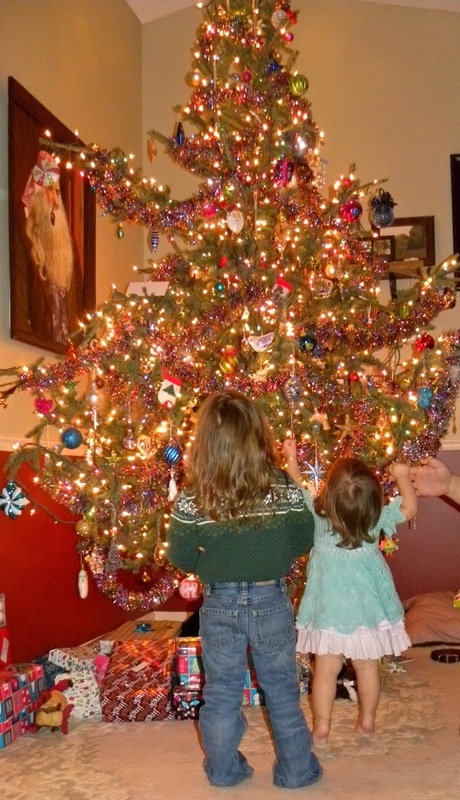 The wonder and awe that the holidays bring. These two keep reminding me (and us) of that. One of the holiday card photos that didn’t make the cut. We spent the past two days “unplugged” celebrating together and with our neighbors. It was a beautifully blessed holiday that kicks off quite a few more family celebrations between now and the new year. For those who celebrate I hope you and yours enjoyed a merry holiday. 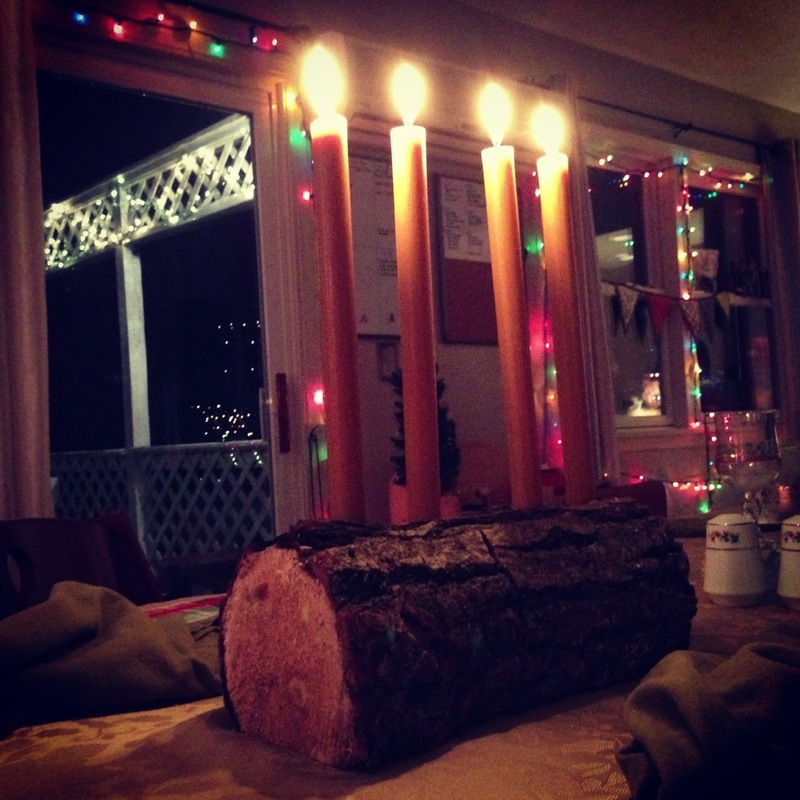 Wishing you peace and light on this Winter Solstice! Our Ameraucanas finally started laying in the last few days. 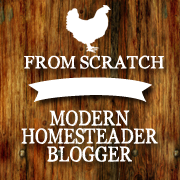 I’m inordinately excited about this newest farm event. After all they are just eggs, and we have been drowning in eggs for a while now. 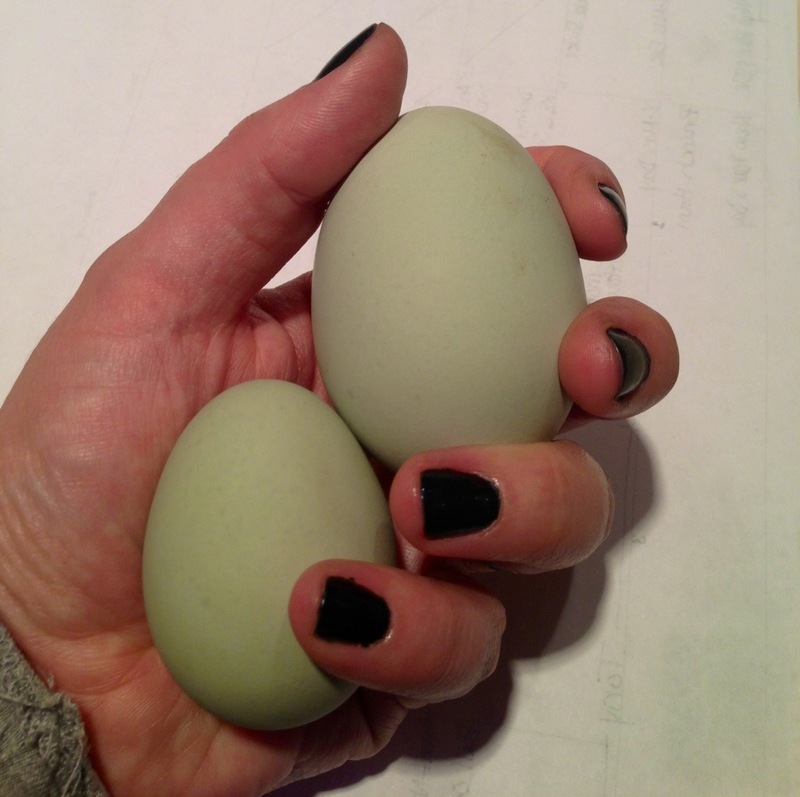 But these eggs, these eggs are green and hopefully, as more of these lovely ladies start laying, there will also be blue and pink ones, in many shades, joining them. I believe that this is my Solstice gift from the farm crew, and the universe. Yes, the one on the right is twice the size it should be, probably a double yoker, which seems to happen when they first start laying and are still working out the kinks. My favorite decorations right now. I got these after the holidays last year at the thrift store during a, very rare, solo mama afternoon. Now here is the remarkable part, I had been eyeing them at Crate and Barrel the year before but had refused to spend the money on them. Then one day wandering the housewares aisle at Goodwill, there they were. I grabbed them up immediately and here they sat, unlit, until now. They make the perfect Solstice decoration. 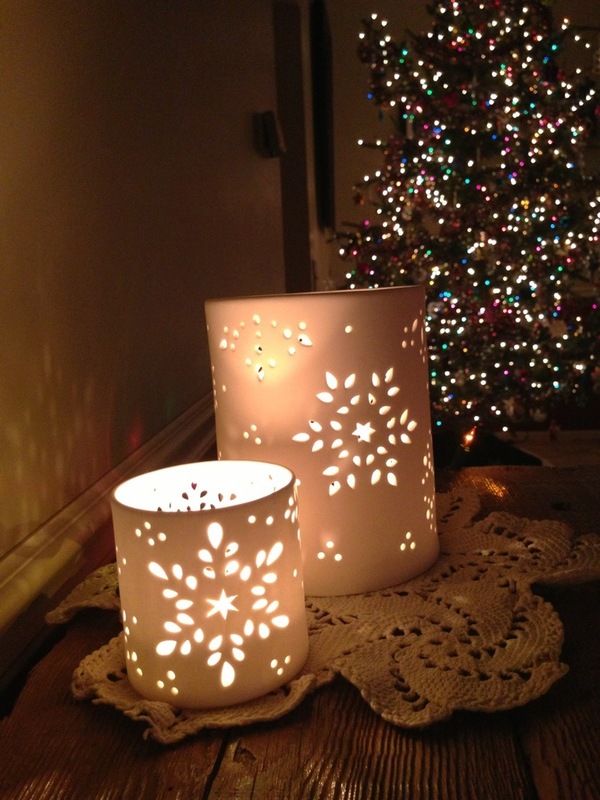 Pop a lit candle in them and they glow, celebrating the soon to be returning light, and the snowflakes adorning them appear, celebrating the quickly approaching winter season. The light always returns, banishing the darkest days and that is indeed what we will gather and celebrate Thursday evening and Friday morning. What is your favorite decoration right now? Is there a special story behind it? No picture from this sad day. We spent most if it holding each other extra close, praying for peace and comfort to all those touched by this morning’s tragedy in Connecticut. I am thankful for the upcoming weekend to spend time together, quietly, as a family. I will see you all back here next Monday. 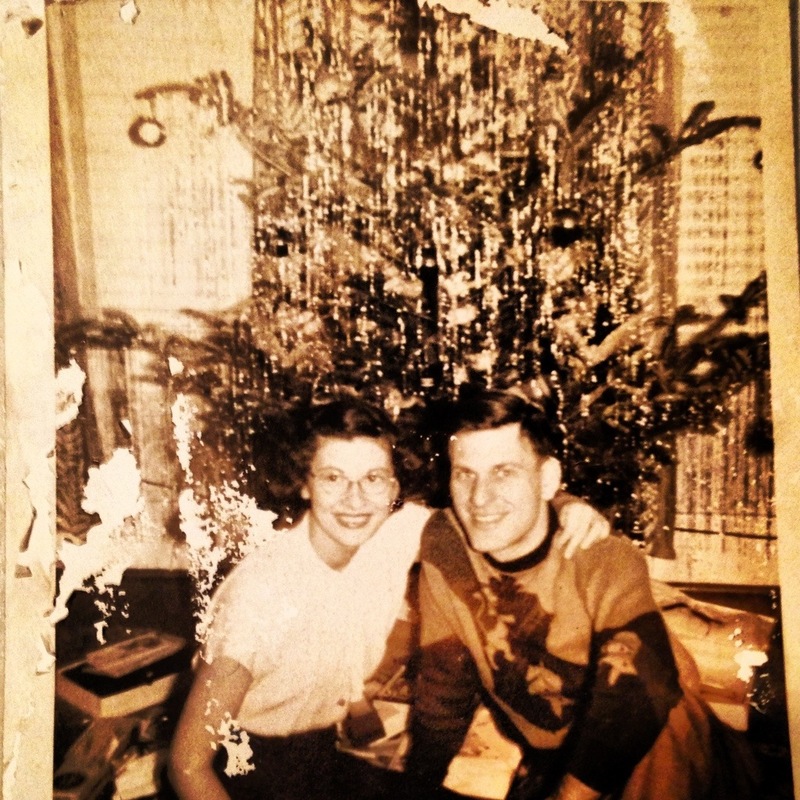 My maternal grandparents, sometime in the forties. If you look at yesterday’s post and then at the tree in the above picture they look remarkably similar, don’t they? Everything I know about interior illumination (and christmas tree decorating in general) I learned from my grandfather, via my mother. He was the decorator, not my grandmother, and to this day is the first one, out of us all, to have his place done up for the season. 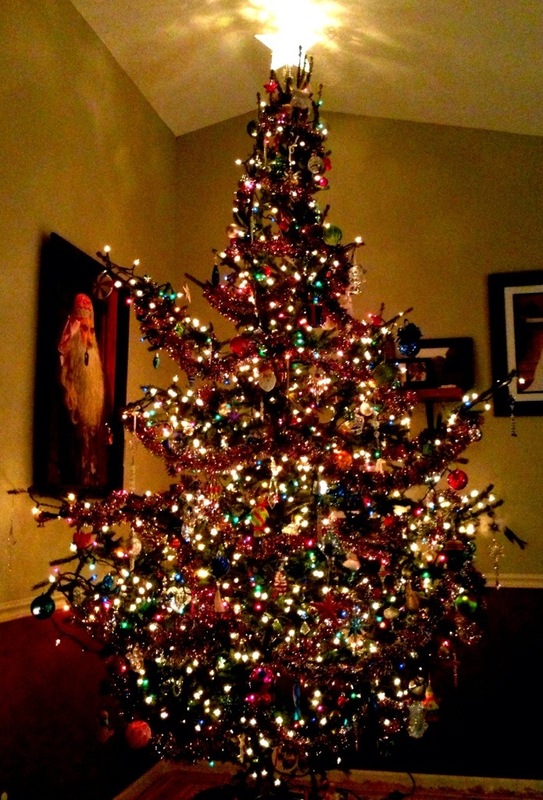 He always went out and picked the tree and, from the stories I heard, spent days decorating it just so. His tinsel hanging process was epic, and required such precision that if anyone was caught “just throwing it about” they were immediately released from any decorating duties for the remainder of the season. For the first 25 years of my life every single christmas, with the exception of two, was spent with them. 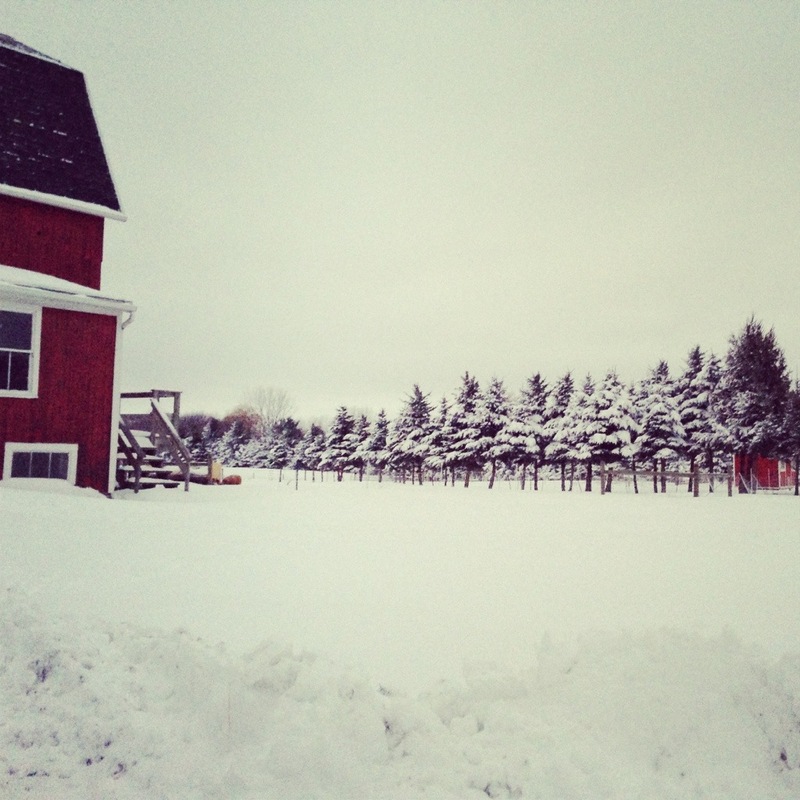 All of my holiday memories are filled with the sounds, smells and sights of them and their home. The traditions that my parents and I had and, in turn, that my kids now have contain them both in every facet. Unfortunately, my grandmother passed away just before PJ was born but my Pops has spent every christmas with both of my kids. He is a constant feature in both of their lives and will forever be imprinted in their memory. And many years from now, when they are decorating their own holiday tree, or come across an old family photo from holidays past, they will instantly know why their lights must be situated just so and their tinsel must hang just right. 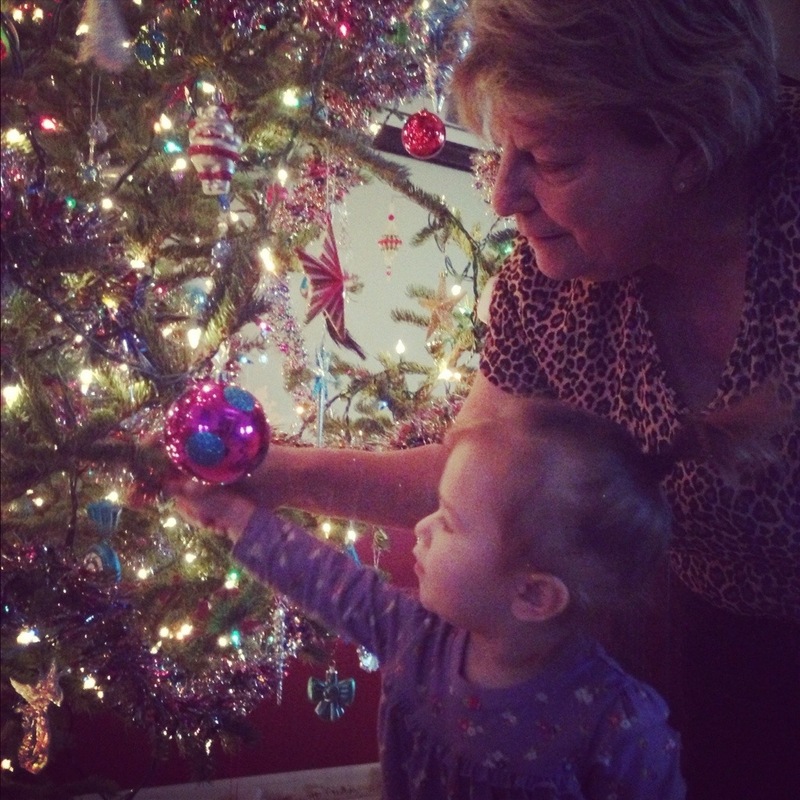 Trimming the tree with Nonni. The tree is decorated and we couldn’t be happier with it. The kids bounced in and out of the room, helping once in awhile or, in Shaelyn’s case, mostly grabbing a round ornament and throwing it across the room, while loudly exclaiming “Ball.” Thankfully, I know my daughter and had the presence of mind to separate out all of my grandmother’s 60-70 year old vintage glass ornaments, along with my collection of crystal ones, and put them safely back in the attic before attempting to decorate the tree. Without those beautiful additions, I think it still turned out lovely, even if it is shaped more like a Whoville tree and less like a christmas farm tree. Creativity was the order of the day when it came to decorating it. Putting lights on a tree with very spaced out branches was trickier than first thought and may or may not have entailed another run (or two) to the store for more lights and hanging the heavier ornaments usually took more than one try to find a branch sturdy enough to hold them (again, thank goodness all breakables were not in use.) This tree of ours has personality all its own, much like a certain someone I know, and both, will of course, always hold a special place in my heart. How’s your decorating coming this holiday season?